I knew some men that had been in the Korean War, but they too didn't talk about it much. Growing up, I never heard much about that war. It's only been in the last twenty years that I learned what happened there, even I spent five years there. I know 36,516 were killed. They call the "Forgotten War". I wonder if the people that loved those who were killed will ever forgot. What I'm trying to say here is that things like Memorial Day and shrines to honor the dead don't replace the people that died. Maybe it's used as way for people to grieve or to legitimize the deaths of those that sacrificed their lives, but it will never bring them back. The real way to honor those that died is to honor their comrades who lived and laughed and that fought beside them. We are not doing that no matter how much people "thank them for their service". Those who died fighting in World War II were fighting because the United States was savagely attacked. Those who fought in Korea were fighting because that nation was attacked. Since then, all that have died, were killed for imperial interests. The Gulf War, Bosnia-Herzegovina, Iraq and Afghanistan and the other operations of this "War on Terror" have no other purpose than to protect US economic interests and to enrich the coffers of the Military Industrial Complex that should have been dismantled when the "Cold War" ended. The Veterans that died, died for a foreign policy that is bent on preserving the commercial and strategic aims of the corporate interests that control the Presidency, the Congress and the military. The Veterans come home to inadequate health care (witness the current VA scandal), inadequate mental health care and inadequate opportunities in the workplace. We have Vietnam. 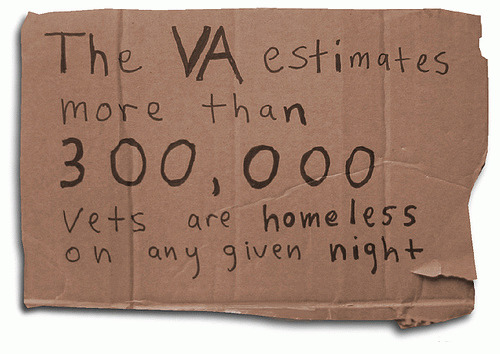 Iraq War and Afghanistan Veterans sleeping in the woods.